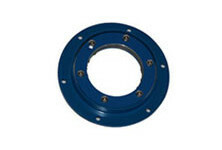 The standard housings are made of Carbon Steel. Fabrication in other metal materials is also possible. Stainless Steel Units along with other sizes are available upon request. Quartz Clear – Designated by a “Q” in the model number. Maximum intermittent operating temperature is 2048°F. Maximum continuous operating temperature is 1600°F (Glass Only)*. Pyrex Clear – (borosilicate glass) Designated by a “P” in the model number. Maximum intermittent operating temperature is 554°F. Maximum continuous operating temperature is 446°F (Glass Only)* . Glass is heat strengthened for safety and is coated with a heat reflecting shield. NOTE: Temperature ratings apply only for the operating conditions of the glass. Ratings for housings vary on type of steel.